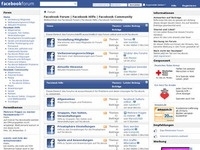 SocialNetworkForum.de - The Forum for the most social network Facebook. Solve problems in the Facebook Help Center, or simply replace in the Facebook community. Is paid every active user who provides at least one or two meaningful posts or threads in the forum. No incentivierter traffic, no cashback / bonus portals.